Poets Corner is calling for submissions from poets and interest from artists for an anthology of illustrated verse to be called “Musings; A Mosaic”. from poets around the world ! “Poets Corner” is coming up with an anthology of English original poems complemented with illustrative sketches, real soon. Out of the entire submission best 45-50 poem will be selected and each one of them will be illustrated with a sketch by an artist . Please send ONE poem, of not more than 25 lines, and a brief note on the theme of the poem for the benefit of the artist. Please note that submission does not guarantee publication as the best 45-50 will be selected. Tribute to my Mentors – the late Gloria Benjamin Yates and the very “LIVE” Les Murray! Gloria and Les are two very, very different poets, both conjurers with words, both larger than life and exuberantly celebrating language with every stroke of the pen. Gloria’s humour and zestfulness, her fearless tackling of any topic and her performances – with Gloria, performance added a whole other dimension to her work. She was a master at delivery – she coloured in her words with her tonal qualities, incredibly expressive face and body language! for this scorch of A.D.
‘djinn of blue kohl highways’ is breathtaking. I am constantly surprised and blown away by Les’ use of imagery – others have paid tribute to this, notably Gorton in his review where he refers to Les and a select few others as “Martians’. Poetry books are books to dip into and savour – to refresh the soul or heighten the sensibilities. 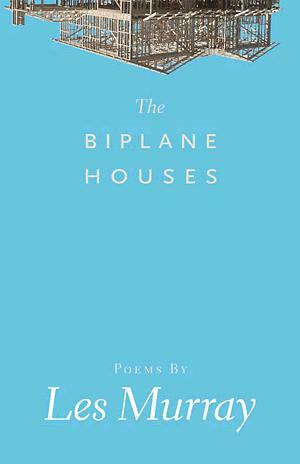 “Biplane Houses” is one of the best collections by any poet anywhere! Words are something I play with – blend, bend, break and mend, shape, shift scape and grift into wild and wonderful patterns of saying! Words can make stories, dramas, poetry, songs, information and I work with all of these. I love showing others how to use and express themselves with words in hands on workshops. I also illustrate the poems I write with line drawings and photography and I make jewellery. That’s me plus spouse, five kids, two cats, possums and geckos and water dragons…. 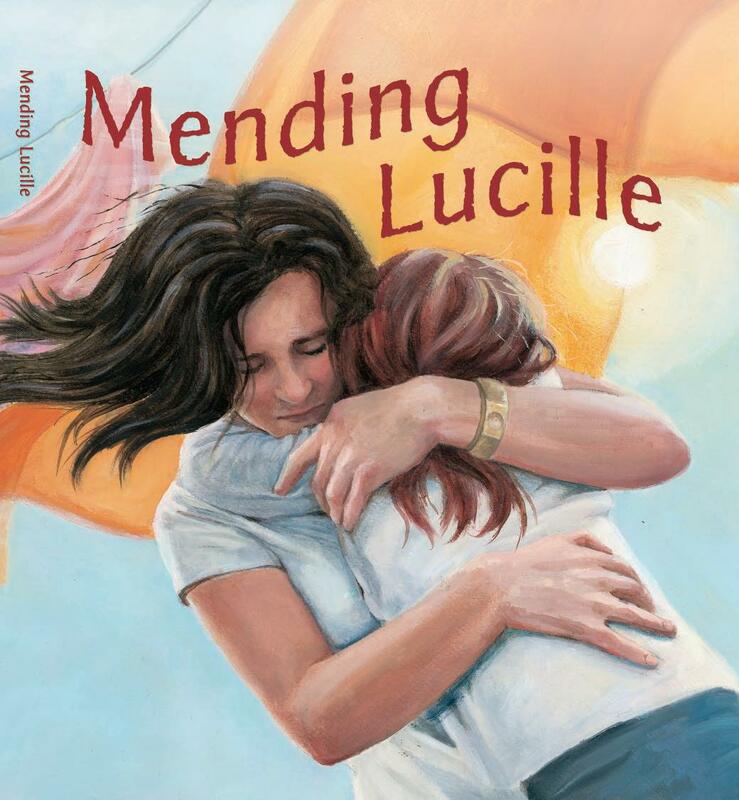 I have just had my 9th book released, “Mending Lucille” with Hachette Livre, and it has had the most amazing reception! It sold out the first print run in the first week, got picked up by ASO (Australia’s biggest distributor) and within the first fortnight was a recommended book for counseling/biblio-therapy by the Australian Centre for Grief Education, Monash Medical Centre. The story in itself did not take long to write – under 15 minutes, although it was ‘cooking’ for many many years whilst I was growing up, listening and observing the devastating effects of childhood grief/loss played out in the lives of those around me. The story was important to me, so when it was accepted by Lothian (Hachette LIvre), I was keenly interested in who would illustrate my story. To be given the opportunity to find my own illustrator as a relatively unknown author was HUGE! I found Sarah on the internet – her style was perfect for the story. Sarah intuitivley saw all the layers and the result – stunning! 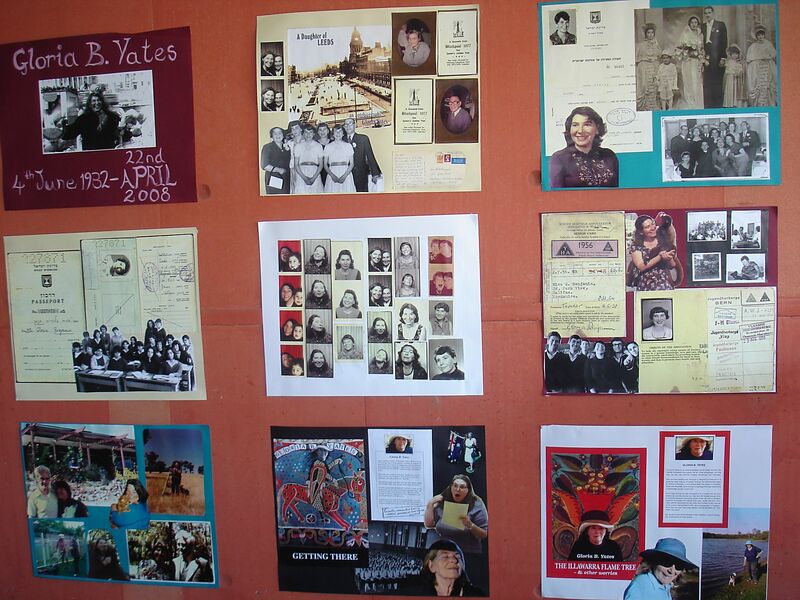 Sarah and I had the honour to be asked to present our story of creating “Mending Lucille” at the SCWIBI International Conference in Sydney, February, 2008. A huge deal for two relative ‘newbies’. The Conference was a BLAST! Met numbers of amazing folk and networked with amazing writers, illustrators as well as publishers from all over the globe. I highly recommend SCWBI membership to anyone! This is an example of my illustrative work. I write poetry under my maiden name, J.R.McRae. 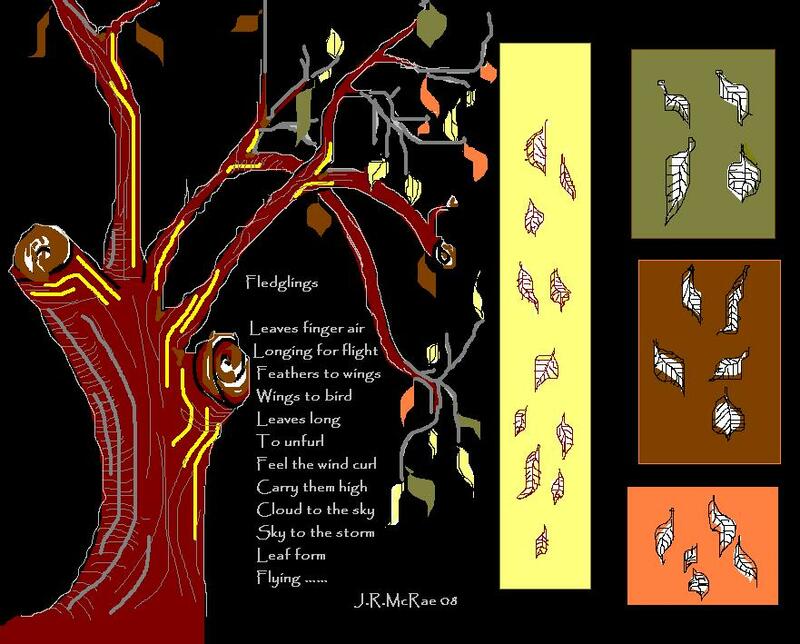 The illustration of the tree came first, then the poem (“Fledglings”) and I added the screen of leaves to the right. I drew it with my mouse in Paint and imported the colours into the palette with the dropper tool. The illustration can add a whole further dimension to the poem, but generally the poem and picture work hand in hand. I like the experimentation and the extension that working with line and color give to my writing. 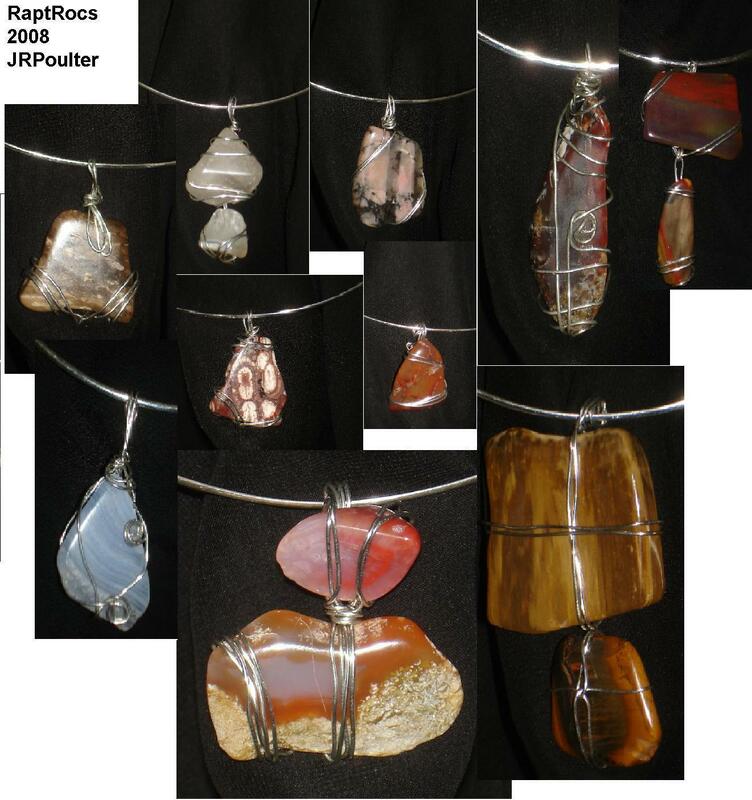 I also make jewelry – beading and what I call RaptRocs – these are semi-precious rocks that have been tumbled to take off the roughest bits. I hold them in my hands and feel their texture, the fissures and shape, any faults – then I wrap them in silver to make pendants etc so that the best features of the rock are highlighted. Now they will say something about the wearer as well – one of them is now in Germany.